With the two shortest days of the cycle tour complete, our 68-mile journey today was our first big test. After the overcast weather yesterday, which resulted in a rather wet ending, we experienced the opposite today with sunshine throughout the cycle. Moving further south along the coast, we were once again treated to some breath-taking coastal views as we roll along the near empty roads. The regular short stops for water, pineapples and other rare fruits kept us refuelled as we hammered the tarmac and ourselves at a blistering pace. Lunch today was in a national park and included a short walk up to a waterfall where we were able to jump in and cool off. 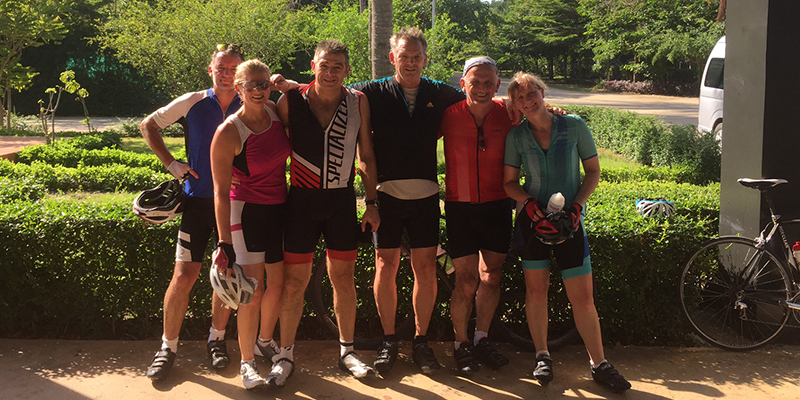 The last 20 miles of cycling seem to just disappear as we cruised along the flat route, working together in a pack. Accommodation on the beach again in the tranquil setting of Sunshine Paradise Resort in Haad-Baan-Krut. The calm sea, empty beach and sea-view pool makes this the perfect environment to relax after the third consecutive day of cycling.